It is a joy for me to let you all know the plum shawlette I was working on is now done (pattern from Audrey at Petit Bout de Moi). This was an enjoyable project, the pattern is easy to follow and I find the result quite excellent. I have used a thicker yarn so it looks fluffier but I love that cosy look. The only tricky bit here were short rows. I had never heard about them before but soon found out it was more than manageable. 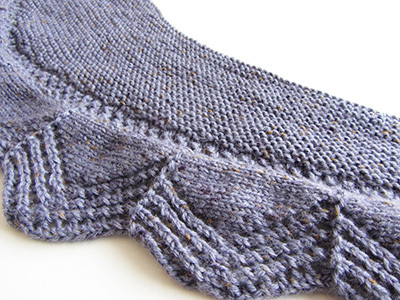 Short rows are used to add shape to the garment by adding stitches in a row you don’t knit until the end. There is a nice tutorial on the Purl Bee blog. I also came across this free course on Craftsy in which four different short row methods are demonstrated: Short rows with Carol Feller. I’ll check it out as soon as I can. If you do before me, please let me know if the course is interesting! The plum shawlette is my make for October as part of A Make a Month, initiated by Annie the Felt Fairy and hosted by Perfect Little World this month. The Flickr group for October is here, come and check out all the lovely makes.